Djitaba Patel-Sackho is a Senior Manager in MSC's Réseau Helix Domain. She is a digital financial services expert with over 7 years of experience gained through projects with development banks, international funding agencies, MFIs in France, Congo and Senegal. Her areas of expertise include project management, DFS, microfinance, SME finance. 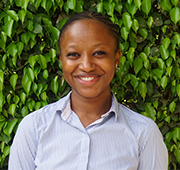 She specializes in business analysis and strategy, product design and implementation, market research. The blog focuses on how strong and sustainable partnership agreements will be essential to improve the liquidity management of agents in the Democratic Republic of Congo.